As I have discussed in previous posts, here and here, the American Health Care Act, the GOP replacement for the Affordable Care Act, is a step in the right direction. Medicaid was established in 1965 and now provides healthcare benefits for individuals and families with incomes up to 133% of the federal poverty level. The states pay 40% of the costs on average while only controlling 5% of how the program is operated. The federal Medicaid law mandates a laundry list of benefits which the states must provide. States cannot charge premiums and copays and deductibles are minimal. 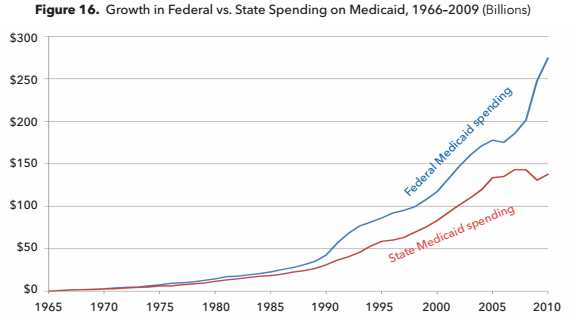 Medicaid is the largest or second largest line item in nearly every state budget. The only tool states have in controlling costs is to pay doctors and hospitals less than private insurers pay for the same care. This means that fewer and fewer doctors are accepting Medicaid patients. Thus Medicaid enrollees have poor access to healthcare. In fact, their health outcomes are typically no better than for those with no insurance at all. An able-bodied adult on Medicaid receives about $6000 a year in government health-insurance benefits. Yet CBO estimates that five million Americans won’t sign up for Medicaid if the ACA individual mandate is repealed as proposed by the AHCA. AHCA block grants will give states more flexibility to manage Medicaid’s costs in ways which increase access to doctors and other providers. It would also decrease federal outlays for Medicaid by $880 billion in its first decade. AHCA’s goal is to ultimately merge Medicaid for able-bodied low-income adults into the system of tax credits which the AHCA proposes for those above the poverty line. Conclusion. The AHCA will make Medicaid into a much more efficient, flexible and effective program for serving low-income individuals and families. This represents a first step in the entitlement reform which the U.S. so badly needs. This entry was posted in ACA, Affordable Care Act, AHCA, American Health Care Act, Avik Roy, Jack Heidel, Medicaid, Medicaid block-grants, Wall Street Journal and tagged Affordable Care Act, American Health Care Act, Avik Roy, health care, jack heidel, Medicaid, Wall Street Journal by jackheidel. Bookmark the permalink. As a reminder, Long Term Care represents the most prominent portion of a State’s Medicaid financial obligation, much more so than direct healthcare services. I understand this but the purpose of block granting Medicaid to the states is to control overall federal costs. The states, which have to balance their budgets, have a much bigger incentive to operate Medicaid more efficiently.